Just as we suspected, Fitbit posted a disappointing holiday quarterly report. Results came below Wall Street estimates as the wearable technology company sold fewer devices in the three months. Fitbit lost 2 cents for every share on revenue of $571 million in Q4. Analysts expected a break-even quarter on the profit-line, and revenue totaling nearly $590 million. The San Francisco outfit sold only 5.4 million devices in Q4 2017, down 17% on the 6.5 million fitness trackers it sold in Q4 2016. However, the average selling price increased by a fifth to $102, primarily due to the launch of the Ionic. The slowdown in holiday sales came amidst increasing competition from Apple’s new smartwatch and less-expensive products from rivals such as Xiaomi. Fitbit said it sold 15.3 million devices in the full year of 2017, a sizable fall from the 22.3 million it sold in the previous year. Ionic, Alta HR, smart scale Aria 2 and accessory Fitbit Flyer accounted for nearly a third of the revenue. The company’s shares plunged some 13% in after-hours trading as the market digested the news. 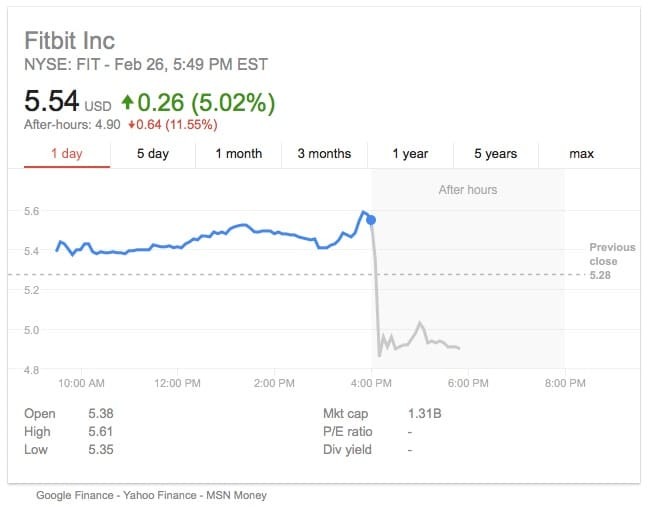 Right now, Fitbit’s share price is trading at about a quarter of its initial public offering value. “In 2018 we’ll focus on managing down expenses, continuing to expand in the smartwatch category and supporting our engaged global community on their health and fitness journeys,” James Park, co-founder and CEO, said in a statement. He also added that investors can expect a more “mass appeal” smartwatch in 2018. Its possible that he is referring to the rumored Blaze 2 device. Its clear that the fitness tracker category is on the decline. Smartwatches are taking over and this is eating into Fitbit’s sales. And its not looking much better for the current quarter. The company sees revenue somewhere between $240 million and $255 million, well below analysts estimates of $340 million.